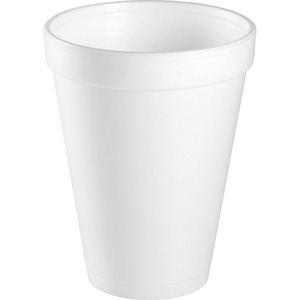 Maintain beverages at their optimal temperature longer with these insulated foam cups. Not only do foam cups keep beverages at their proper serving temperature on the inside, but they also keep hands comfortable on the outside with a strong, one-piece construction. Insulated foam delivers hot or cold drinks the way they were meant to be. Space-saving design allows easy stacking and features a distinctive pedestal. Small drink cups are ideal for coffee, cappuccino, tea, hot chocolate, hot cider, juice and soft drinks. Compatible lids are not included. These 12 oz. cups can be used with Dart 12SL (translucent with straw slot), 12UL (white with sip thru), 12CLR (clear with no vent), 12FTL (white with Lift n' Lock), 12FTLS (translucent with Lift n' Lock and straw slot), 12EL (white for cappuccino) and 12HDLC (clear with dome).